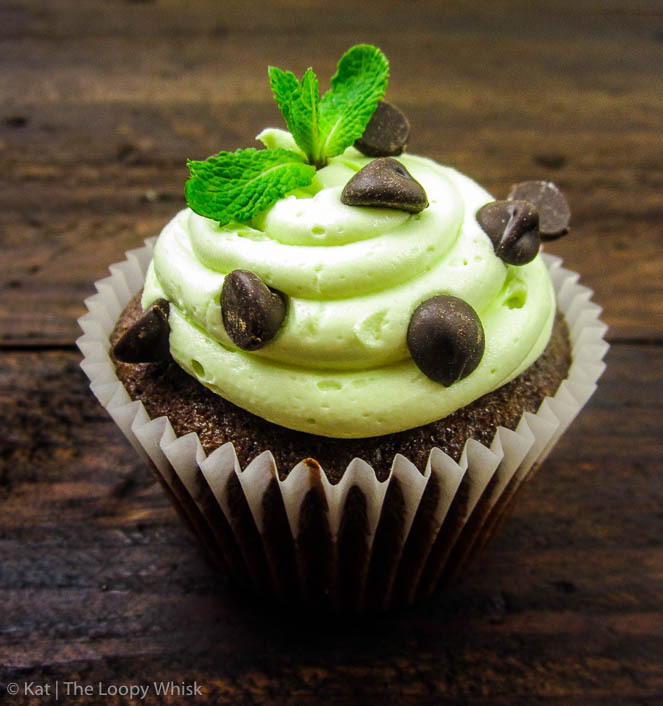 Fluffy chocolate cupcakes and silky mint buttercream, all topped off with extra chocolate chips (because why not?). 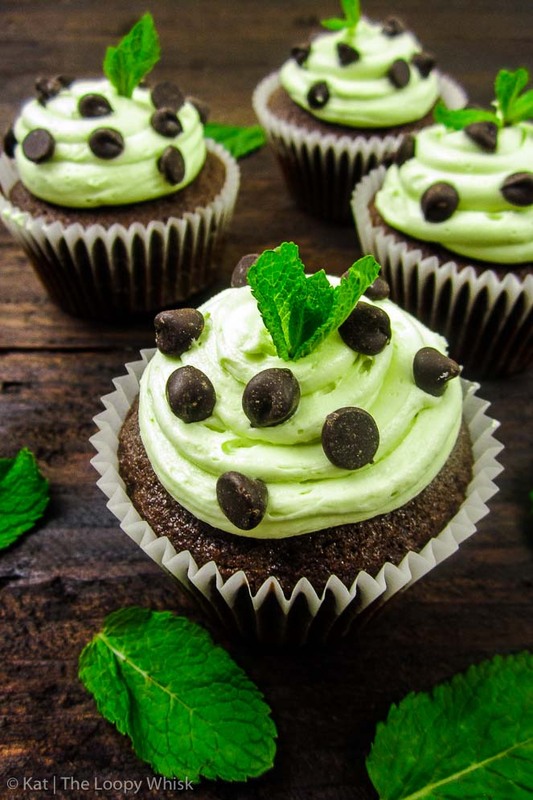 Ridiculously easy and quick to make, these mint chocolate chip cupcakes will impress, as well as convince everyone you’re amazing at this whole being-an-adult-thing. In my mind, the mint-chocolate combo always represented adulthood, or at least a step in that direction. I am convinced it’s all due to mint chocolate thins – you know the ones I’m talking about. The very very thin chocolate pieces with a minty cream in the middle that are kind of bitter and have an almost overwhelming peppermint aftertaste. I bet when you were a kid you saw your parents and their friends enjoy them after dinner at least a few times. The brand I remember seeing the most are the After Eights – always wrapped individually, in a manner similar to tea bags, in dark emerald green wrappers that had a swirly writing on them that seemed ultra-sophisticated to my childish eyes. Nowadays, I do eat (and love) chocolate-mint… well, pretty much anything, really, but don’t feel like much of an adult at all. Perhaps I should eat more mint chocolate things? 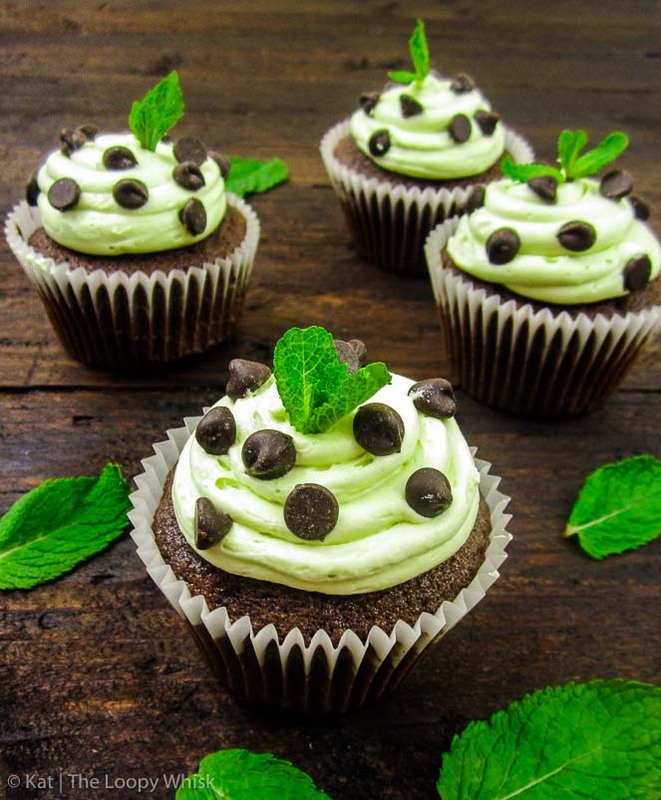 In any case, these mint chocolate chip cupcakes cannot hurt. 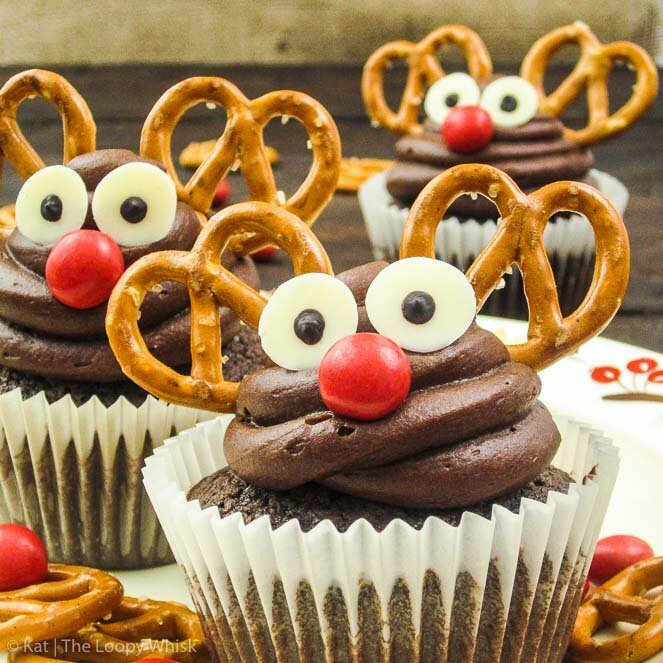 The thing about these cupcakes? You make them by chucking everything into a bowl and whisking for about a minute. That’s it. And when I say everything, I mean everything. Creaming together butter and sugar? No need. Carefully folding in flour? Nope. There’s no catch, pinky promise. 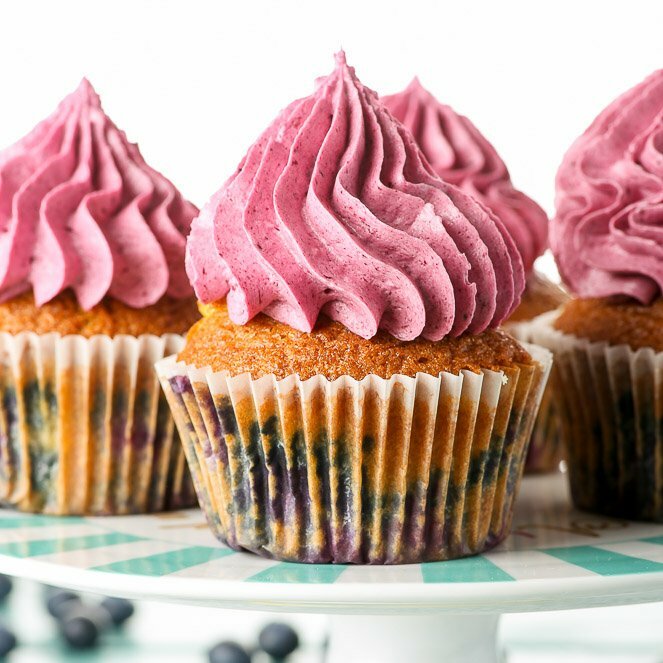 It’s a fool-proof method that takes no time at all, and produces fluffy, cloud-like cupcakes with an ideal balance between the sugary sweetness and the bitterness from the cocoa powder. Every. Single Time. Oh, and we’re mixing in extra chocolate chips, as well, because we’re totally rebellious like that. The buttercream is slightly more complicated in that you actually need to add the icing sugar to the butter in two stages, as well as a bit of milk with the second batch of sugar. And you also need to add the peppermint extract and the green food colouring (which gives the buttercream the minty green colour – isn’t it just lovely?) in a separate step at the end. Gasp. Yes, it is that kind of recipe. The kind that produces drool-worthy dressed-to-impress results with minimal effort. And we all love love love such recipes. 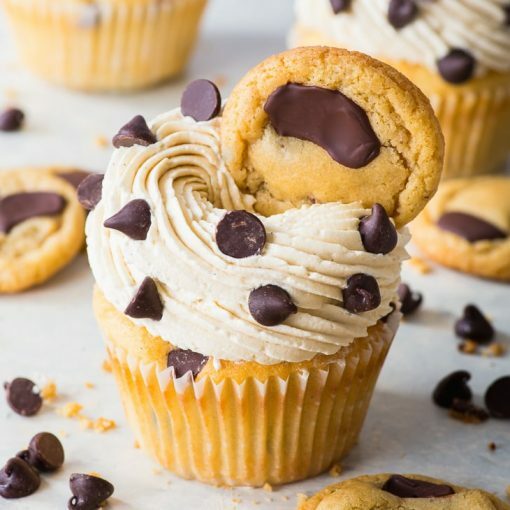 So next time you’re feeling down on yourself because you think you’re failing at the whole being-an-adult thing (you’re fine, trust me, nobody actually knows how to be an adult), whip up a batch of these mint chocolate chip cupcakes, and proceed to feel good about yourself. Or even better, when you’re invited to the next dinner party, bring these along, do an ‘and-here-are-some-I’ve-prepared-earlier’ (you know, along with a slightly dramatic flourish, but don’t overdo it, it ruins the effect), and blow everyone away with your amazingness. I believe in you, and your not-quite-adultness. 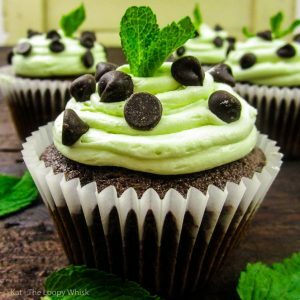 Fluffy cloud-like chocolate cupcakes, silky-smooth mint buttercream, and extra chocolate chips. 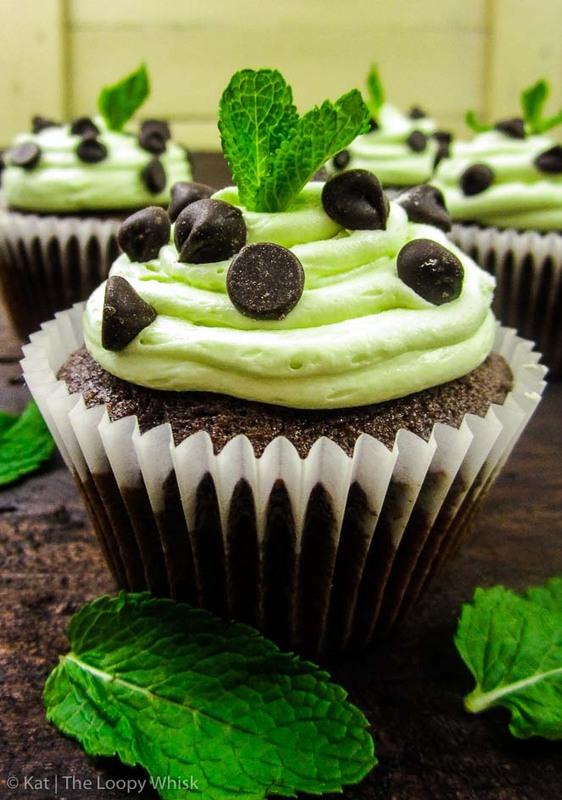 These mint chocolate chip cupcakes are dressed-to-impress and oh-so-delicious. Sift together flour, baking powder, bicarbonate of soda, salt, and sugar into a large bowl. Add butter, eggs, peppermint extract, chocolate chips, and the cooled cocoa powder paste to the flour mixture. Add green food colouring and peppermint extract, mixing for ~1 minute, until evenly incorporated into the buttercream. Decorate with chocolate chips and fresh mint leaves. The cupcakes can be kept wrapped in cling film, or in a closed container, in a cool dry place for ~3 days (good luck not eating them within one day). Note: I used a round nozzle, but you can use other types. 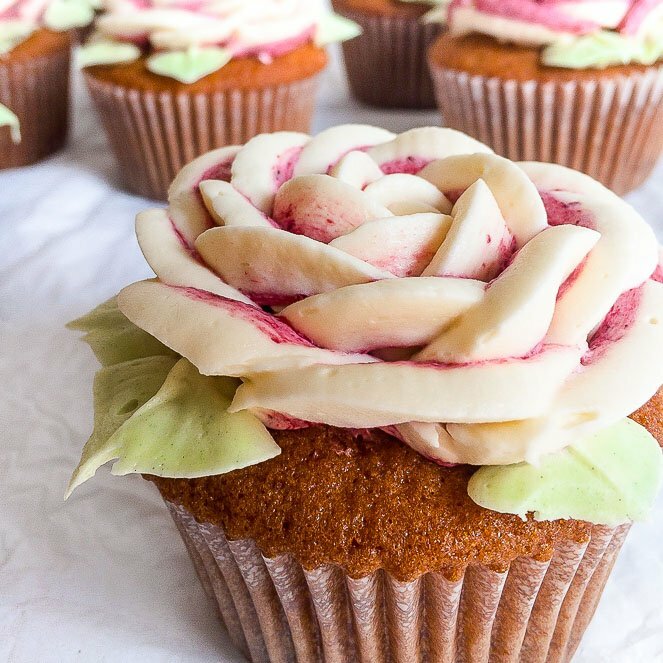 Let your creative side free, and decorate the cupcakes in any way you want.